Having trouble figuring out why your website isn’t getting more traffic? Its possible the content on your site has simply been cut and pasted from another site – rending your SEO impotent. Initially, I couldn’t figure out why the law firm’s site was performing so badly – the technology was fine, the content seemed fairly well written and there was a reasonable link profile. Despite this, the site was averaging less than 2 visitors a day from unbranded natural search – and very few of those visitors were landing on the practice area pages. Digging deeper, I found that the actual content on the practice area pages was cut and pasted across other LawyerEdge clients. 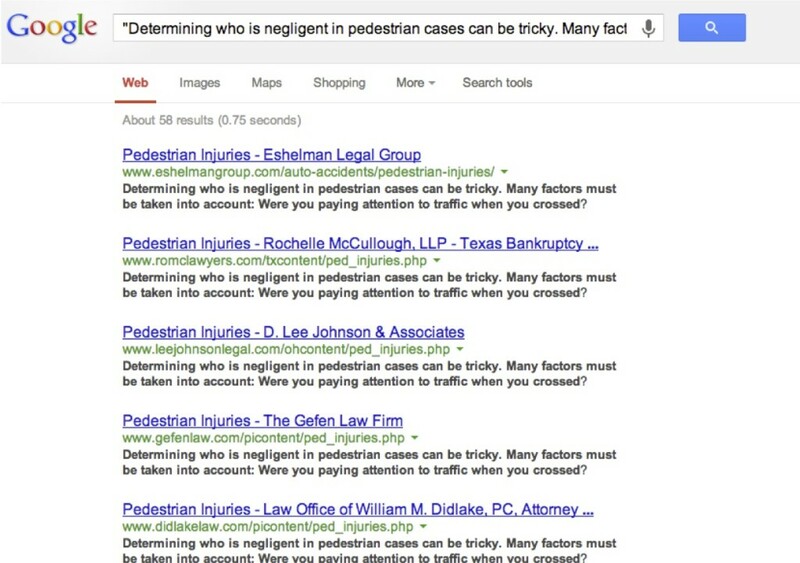 In the example below – we can see that Google has identified 58 other pages with the exact same content as this law firm’s page for pedestrian knock down accidents. When I looked across the website’s landing pages, I found that almost all of them had content that was duplicated across the web. 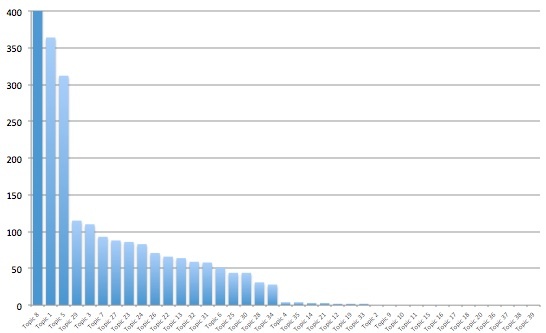 In the graph below, the vertical axis shows the number of pages found on the web containing the exact same content as the law firm’s topic pages. Of the 40 pages I reviewed, just 13 had unique content. Search engines hate duplicate content because it can generate a really bad user experience. Here’s why: Using the above example, imagine I do a Google search for “determining who is negligent in Pedestrian cases”. The first result I click to doesn’t give me what I’m looking for, so I click back to the search engine and try the second result . . . . which leads me to the exact same content on another site. Now I’m annoyed and instead of clicking back, I load up Bing to try to find something different. Note that Panda is a site-wide penalty – which means that duplicate content on many pages will impact performance of the entire site – even those deliciously well written unique and insightful pages. The bar graph above, which shows the majority of the law firm’s pages having duplicate content indicates they have most likely been hit by the Panda update. The Law Firm of Kevin A. Moore, P.A. The Law Offices of Fuentes & Berrio, L.L.P. Robert B. French, Jr., P.C. The Law Offices of Weinstein & Scharf, P.A. McAdory Borg Law Firm P.C. For a funny one – check out this: The Law Offices of This is Arizona – a template, presumably available for purchase with ghost Attorneys John and Joan Smith. The most obvious sign of duplicate content, of course is zero to low inbound search traffic to specific pages. You can diagnose this in Google Analtyics using the “Landing Pages” tab under content (make sure you filter for ONLY “organic search traffic”). If your search returns a ton of results . . . its time to start writing. What’s your first recommendation to a client like this? Noindex pages until unique content can be developed? How do you protect your own clients from stolen content? I’ve personally used services like plagspotter in the past with various degrees of success. I’d love to see a future follow-up post that shows the rebound once dup content is replaced w/ unique. Specifically, how much time it takes for those penalized pages to see traffic. Chris – great idea on the followup! As far as content getting stolen – if you have a reasonably robust link profile, the search engines are almost certainly going to ID your content first – in which they will usually (but not always) ID that as the canonical version. In terms of no-indexing – I’d focus instead on just rewriting this quickly and well, unless the problem is extremely widespread and hits a large volume of pages. Thank you for an explanation which makes complex concepts easy to grasp. It explains a lot about why some firm sites do well despite horribly self-written content.